As expected, the Orange County housing market slowed in July a bit, transitioning from the red hot Spring Market to the beginning of the Summer Market. It was as if housing downshifted a gear, from 5th to 4th; it was still cruising, just not as fast as the spring. August typically looks a lot like July, maybe increasing a smidgen, but still slower than the peak of the real estate market, March through mid-June. This cyclical phenomenon is easily explained by logically looking at the timing of the year. There are plenty of summertime distractions, especially in Southern California, from splashing around in the waves to traveling on the annual family vacation. The distractions lead to less buyer activity and demand drops. 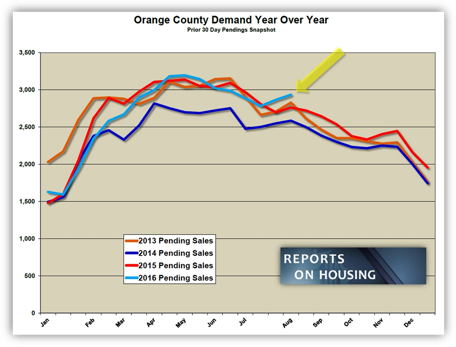 That’s the typical, annual real estate cycle in Orange County. Spring is the busiest time of the year. Summer is the second busiest. Then, there is the Fall and Winter Markets, where demand continues to downshift until it drops to its lowest level of the year by the end of December.